The Workers Party Wants You (And Your Dollar)! The Workers Party is undertaking a membership drive to make themselves the largest far left party in the country. The WP is the outer shell of the Revolutionary Workers League, a strange mixture of Maoism and Trotskyism, modelled I believe on the US Workers World Party. To join the Workers Party you simply have to pay your one dollar fee and subscribe to five simple leftist policy statements. Throughout August, Workers Party members will be campaigning to increase the national membership base of the Workers Party. During this campaign we will be asking Spark readers, Workers Party supporters, and other progressive-minded people, to join the Workers Party. We are encouraging people to join up as solidarity members, as this will help us stand in the 2008 election. Previously, in 2002, and in 2005, we have stood candidates in up to nine electorates. During our election campaigns we challenged the Labour Party and its candidates, and we confronted other parties that seek to maintain capitalist social relations. We want to continue to draw attention to genuine working class issues such as the right of all workers to a living wage, workers’ control over hours of work, opposition to NZ and Western intervention in the Third World, freedom to strike, and equality for women, ethnic minorities, and migrant workers. One of the aims of our membership drive is to gain enough members so that the Workers Party can receive party votes, as well as electorate votes, in the 2008 general election. This will make the Workers Party more relevant to a number of workers, and help us gain a wider audience for our politics. We need at least 500 members to entitle us to receive party votes in the next election. In the past we have gained up to 250 members by signing up workmates, students, and sympathisers. Between August 2006 and November 2007, we will have a series of campaign months in which we will hold extra stalls and prioritise the signing-up of new people to the party. The first of these campaign months is August 2006. During campaign months each Workers Party branch, and active individual members in small cities, will have a sign-up target to meet. We want to make sure that genuine worker’s issues are made visible to as many workers and progressive people as possible. 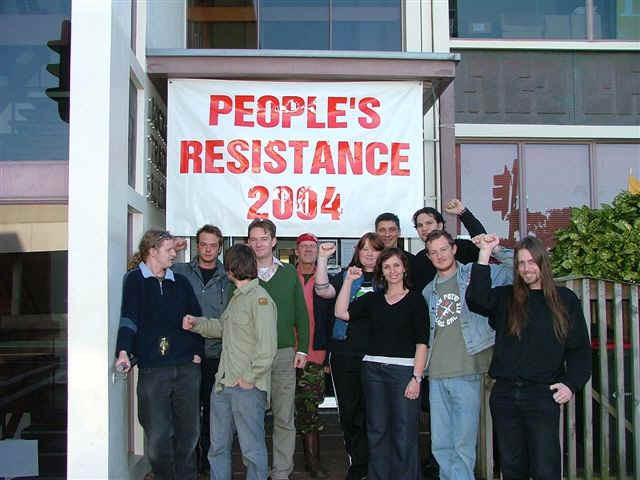 In 2008, other left-wing organisations, as always, will again be content with putting forward ‘strategic’ votes for The Greens and for the New Zealand Labour Party. The Workers Party, on the other hand, will use the elections, and the lead up to the elections, to elevate genuine class politics. This approach will be particularly important in the period after the collapse of the Alliance. The campaign slogan ‘Let’s Make Workers Issues Hi-Viz’ was chosen by Workers Party members because it relates to the aims of our party in elections, and also because it does not contain all the ultra-revolutionary bluster that far-left organisations often shroud themselves in. plus the person taking the photo. I bet you they used a delayed photo setting so that the camera person could be in the photo too to boost numbers. You guys are just SO mean! ha ha lol...whats the bet they are in favour of state funding for their political campaigning? I wonder if any of these foolish youths (love the cute raised fists too) have actually done a day's work in their lives? Hey thanks for reprinting that Workers Party stuff. Their programe makes sense, just the sort of thing I've been looking to hook up with. F**king opportunist "party." Just take a look at the "Workers" parties response to real workers struggles this year: rank and fileism, petty-bourgeois stalling on truckdrivers strike accusing drivers of being truckers of being "right wing." The Workers party is not made up of any genuine Trotskyists; they are though indeed forged through the reactionary remnants of NZ Pabloites (yeah look that up!!! )and if you go on the parties page, the "cadre" openly daily engage in political disorientation and idiocy.. Oh I get to watch some Good ol' discussions like "what do you think of this..." kind of stupiditiy and blind impressionism. You Workers party make me laugh: parroting around campaigning at rugby games like the true-opportunists that make up this "party". What a fraud to the working class to see oh so clearly and form a genuine Marxist/Trotskiyst party in solidarity with the ICFI. www.wsws.org. Anything else and the "Workers party" opportunists they are sowing illusions for the workers party "cadre" to fall into. What kind of "workers" party campaigns at Rugby matches promises (i.e. LYING) to real workers that you will "remove the gst off beer" thus workers and students should join this demoralised rank party of petty bourgeois and deluded; no mention of 'private property', 'public ownership', 'kiwirail', 'nationalisation', 'privatisation/recipe for social disaster',etc, just "we'll take the GST of off beer!' What a way to fillup your 500 persons QUOTA HERE WE WILL HAVE HERE a "Workers" party controlled by pettybourgeois middle class goonies and who's rank and file have been asked to join via opportunist practices. WHAT DISGUST! "The WP is the outer shell of the Revolutionary Workers League, a strange mixture of Maoism and Trotskyism, ." LIES! (except for the last part) "modelled I believe on the US Workers World Party." There are no genuine Trotskyists in this fraud "workers" party. There are indeed Backward Maoists, Pabloites (pseudo-'Trotskists' affiliated with the "United Secretariat" which turned it's back on the Trotskyist Fourth International/ICFI in 1953 and 1963. Naturally the opportunists of the USFI- it's various national sections destroyed themselves following the stalinist "Che" Guevara getting lost in the jungle and killed against prof French and American troops. The USFI as a whole succumbed to the class pressures of the time, and the prefigures and original figures who went to form the "Workers" party are no different. Though we can grant they were never really a serious Trotskyist party ever there was no 'degeneration'.. this "Workers party" was DEGENERATED DECAYING from birth due it's very development and origins. South Africa Going Down the Zimbabwe Road?